At one time or another, any family may find itself in need of some form of support. Call (949) 552-2727 or read information on this website to find out more. Families Forward helps homeless and low income families find and maintain stable housing and achieve self-sufficiency. Families Forward is here to help. Emergencies can happen to anyone: a death in the family, a loss of a job, an illness, or a divorce can be devastating, both emotionally and financially. Our goal is to prevent the fear and hopelessness that can occur as a result of a crisis, and ensure that the children’s welfare and stability are protected as much as possible. Click here to learn more, or haga clic aquí para aprender más. Families Forward’s Housing Program is designed to help families who have recently faced a crisis that left them homeless. Families Forward helps these families get back on their feet by providing housing, counseling, career coaching, life-skills training, and referral services. Families enrolled in the program may receive rental subsidies to give them time to regain their self-sufficiency. Length of stay in the Housing Program varies from family to family. Through partnerships with local apartment communities and access to Families Forward’s housing resources, families who have lost their housing are able to access rental housing. Candidates for the Housing Program must have a minor-aged child and be homeless. This is an intensive program designed to help motivated families achieve and maintain financial self-sufficiency. There is a high demand for entry into our Housing Program and we cannot guarantee placement. If you are interested in applying to the Housing Program, please call our office at (949) 552-2727 during business hours or complete a Client Profile Form. Because we cannot guarantee placement in a home at any particular time, we do not keep a waiting list. Whenever there is an opening in the Housing Program, our case managers review the family information forms that have been submitted. Please keep your contact information current to help us reach you more easily if a new opportunity opens. If you are in an emergency situation or other crisis, call us and we will do our best to assist you in locating other options or check the Community Resources page for additional resources. 1. How do I apply for the Families Forward Housing Program? Complete a Family Information Form by calling us at (949) 552-2727 during business hours, and we will contact you if you meet the qualifications and if there is housing available. 2. How do I know if I qualify for the Families Forward Housing Program? You must have a minor-aged child under 18 years of age and be homeless. Families Forward Homeless Intervention is an intense program specifically designed to assist a family in achieving and maintaining financial self-sufficiency. Our clients must have the desire and perseverance to work with our case managers to become self-sufficient. 3. Do you offer immediate or emergency housing? We do not have emergency shelter. For emergency shelters in your area, please contact 2-1-1 Orange County, a general resource center that serves all of Orange County. If you are looking for affordable housing, try searching www.ochousing.org. 4. Do you offer rental or utility assistance? Families Forward does not have grant funding for rental or utility assistance. 2-1-1 Orange County can provide a list of current agencies that may have funding for these types of assistance. Families Forward follows the County of Orange guidelines on management of personal information. Click to read our Privacy Notice in English or Aviso de Privacidad en Espanol. Food assistance, in the form of nonperishable items such as canned goods, rice and pasta, is available to income qualifying single individuals, couples, and families residing in South Orange County (from Tustin to San Clemente). When available, fresh produce, bread and eggs are offered. Essential infant supplies such as baby food and diapers may also be provided when available. To qualify, you must live in South Orange County or be homeless. We are part of a network of food providers and do our best to stay current with all the food resources in Orange County. To meet your needs, we may refer you to another provider that is closer to your residence. Please see the Food Pantry Policy in English and Spanish for more details. If you need food immediately and it is an emergency, call us at (949) 552-2727 regardless of residence or income. We can supply emergency food as well as register you for the food program if you qualify. Call us at (949) 552-2727 from 9:00 am – 5:00 pm Monday through Thursday; 9:00 am – 1:00 pm on Fridays. We are closed Saturday and Sunday. Please see the Food Pantry Policy for more details. 1. When is the Food Pantry available? Our normal Food Pantry hours are Tuesdays, Wednesdays, and Thursdays from 9:20 am – 4:30 pm. To provide the best service to our clients, we use an appointment system. Please call (949) 552-2727 to make an appointment. 2. What is the process for picking up food? For your first scheduled food appointment, arrive at Families Forward at 8 Thomas in Irvine with your driver’s license or identification card, a utility bill or other proof of residency, and a proof of income. If you are a new client, we will collect information about you and your family to create your file and assist you in addressing other needs. You will be required to bring your photo ID to each appointment. 3. Am I allowed to “shop” the Food Pantry? Due to safety and liability reasons, clients are not permitted in the shelving area. However, we provide an optional program called Client Choice in which clients are able to select their preferred food items from an order form rather than receive a prepackaged food basket. Download more information in English and in Spanish Appointments are required. 4. How often can I visit the Food Pantry? The Food Pantry may be accessed up to 12 times a year. You may pick up food one time per month, waiting at least 30 days between each food visit. 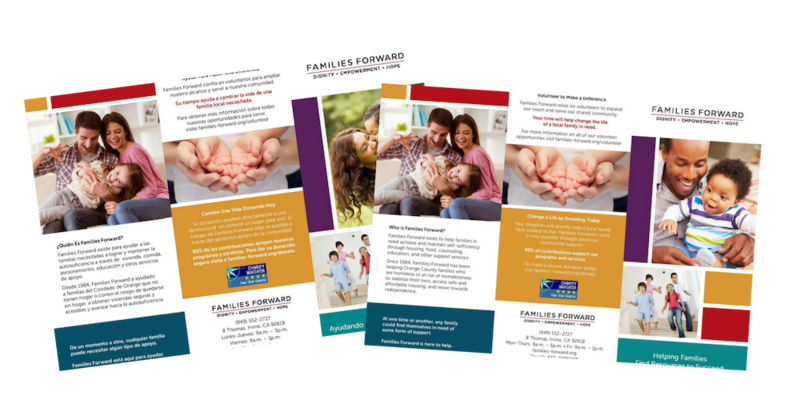 Families Forward’s Community Counseling Program features solution-based counseling focused on identifying what the participant wants to accomplish. Counseling is short-term, individual, marital, family, and group counseling for personal and interpersonal concerns. Community Counseling services are available to income eligible families with minor age children residing in Orange County. Fees are based on a sliding scale. No one will be turned away due to inability to pay. Hours of operation are available by appointment on Monday-Thursday 9:00 am – 5:00 pm as well as Monday and Thursday evenings as needed. If you are interested in counseling, please call our Counseling Office at 949-379-8132 or email at counseling@families-forward.org. Click here for more information in English and En Español. If you are looking for more comprehensive health counseling, please contact 2-1-1 or Orange County Health Care Agency at (714) 834-4722. Families Forward provides career coaching to our housing clients, assisting them with job searches, preparing for interviews and ultimately improving their earning potential. Additional career resources can be found at the agencies listed below. Learn to be a smarter renter! To help any renter, novice or experienced, become a THRIVING renter, Families Forward provides free tenant education workshops. Workshops are held quarterly and are open to the general public. tips to ensure maximum security deposit refund! Registration is required and space is limited. Please call 949-552-2727 to register or complete a Tenant Education Workshop Registration Form. Please note that childcare will not be provided during these workshops. 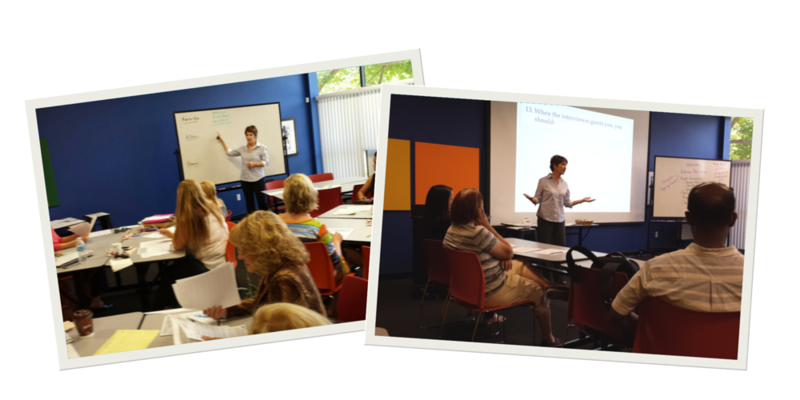 Click here for information on the next Tenant Education workshop offering. All participants will receive a certificate of completion, comprehensive Tenant Education Guide to take home with advice, guidelines and worksheets as a practical tool to use in the apartment search and rental process. Families Forward manages the application process and access to select a number of Affordable Housing units. Families Forward will announce availability of any new units on our website. There will be no Families Forward waitlist. In the future, once a unit becomes vacant, the opportunity to apply will be posted here and will be processed on a first come, first serve and first qualified basis. To qualify, applicants must complete all required forms and provide specific documentation that they meet income qualifications for the designated rental units. Please note: The opportunity to submit an application packet through Families Forward does not guarantee tenancy. Current tenants: log into your resident portal here for online payments, maintenance and account information.